The lab activities in this module were developed by Erin Bardar of TERC for the EarthLabs project. Why teach about climate and the cryosphere? Snowman in Alabama. Photo taken by Melinda Shelton; Image source: Flickr. Snow and ice are everywhere. Many different kinds of snow and ice, including sea ice, lake and river ice, snow cover, glaciers, ice caps and sheets, and frozen ground, make up the cryosphere (a word derived from kryos, the Greek word for cold)the places on Earth where water exists in solid form. Although most of Earth's frozen water is found near the poles, snow and ice can be found on all seven continents. Snow and ice affect lives all over the world. In many parts of the world, including much of the United States, the cryosphere is a seasonal visitor. 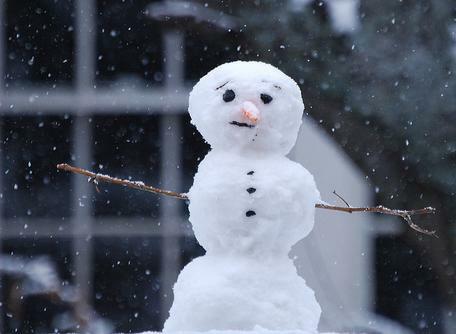 For some, snow and ice are a source of recreational activities like skiing, sledding, ice skating, and building a snowman. For others, the cryosphere is a lifeline. With nearly 70% of Earth's fresh water stored in glaciers and ice caps, hundreds of millions of people around the world rely on the cryosphere as a source of drinking water. In Arctic regions, sea ice provides a home for animals like seals and polar bears, feeding and breeding areas for a variety of migrating species, and hunting grounds for local communities. 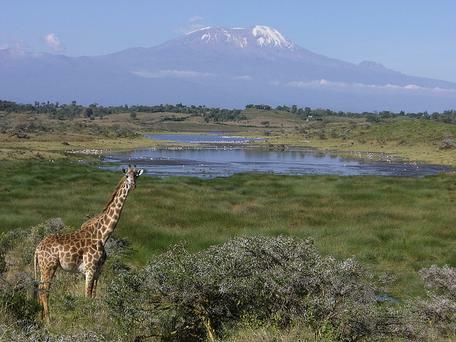 Giraffe grazing in front of Mt. Kilimanjaro glaciers in Tanzania, Africa. Photo taken by hoteldephil; Image source: Flickr. Snow and ice are an important part of the global climate system. Acting like a highly reflective blanket, the cryosphere protects Earth from getting too warm. Snow and ice reflect more sunlight than open water or bare ground. The presence or absence of snow and ice affects heating and cooling over the Earth's surface, influencing the entire planet's energy balance. Changes in snow and ice cover affect air temperatures, sea levels, ocean currents, and storm patterns all over the world. Just as changes in the cryosphere can influence climate, changes in climate can also dramatically alter the Earth's snow- and ice-covered areas. Unlike other substances found on the Earth, snow and ice exist relatively close to their melting point and can easily change back and forth between solid and liquid. With just slight variations in Earth's temperature, thousands of square miles of snow and ice can accumulate or melt, making the cryosphere one of the most powerful indicators of climate and climate change. The cryosphere provides vital information about past, present, and future climate. Ice cores drilled from ice sheets and glaciers provide annual records of temperature, precipitation, atmospheric composition, volcanic activity, and wind patterns going as far back as 750,000 years ago. 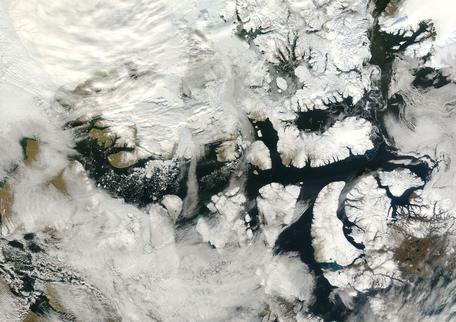 Today, scientists use satellites to observe the cryosphere and monitor changes. Using these data, they are able to make predictions about what the cryosphere and Earth's climate might look like many years from now. This unit will introduce students to many of the complex issues surrounding the cryosphere and its connections to climate. They will read articles, conduct hands-on lab activities, watch videos, analyze data, maps and graphs, explore online interactives, and discuss ideas with you, the teacher, and classmates—all of which will help them to understand how snow and ice interact with water, air, land, and life to regulate and reflect Earth's climate conditions. How and why does the cryosphere change over time and space? What are the timescales associated with changes in the cryosphere? How do climate and the cryosphere influence each other? Read the Lab Overviews section, which identifies all of the materials you'll need to gather and provides a quick scope and sequence of the unit. If you have not already done so, please read the Climate Series Introduction, where you will find additional information about climate science as well as suggestions for helping your students get the most out of their engagement with the module. Install and practice using new software and tools, acquire needed lab materials, and print student handouts. Several options for assessing student understanding are provided throughout this module. Stop and Think questions can be used to assess student understanding at key points within each lab. These questions are available on the Instructor Page for each lab, under the Printable Materials heading. Short written tests to assess student understanding of material covered by each lab can be found on the corresponding Instructor Pages, under the Assessment heading. A full list of lab-level assessments as well as a cumulative end-of-module test can also be found on the Assessments page. The resources below provide important background information relevant to this module and to the entire set of Climate EarthLabs modules. Below are links to a set of resources which you may use if you wish to lead a one-day workshop that introduces this unit to other teachers. The resources are suggestions, and you are free to modify them and use them as you wish.